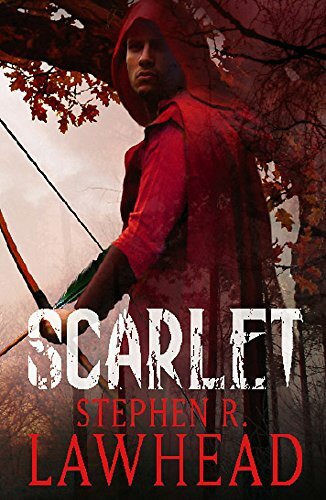 An arresting cover showing a scarlet hooded man with a bow and arrow gives a clue as to the subject of this, the second in Lawhead’s trilogy about Robin Hood, which began with Hood in which the author had moved the scene to the Welsh Marches and the time back a century to the time of William Rufus. Lawhead makes no pretence to be a serious historical novelist but a writer of historical fantasy and once the reader has come to grips with that, this is a good read. Told as it was dictated to a monk called Odo, Will Scarlet or William Scatlocke as he is known, is waiting to be hanged, and looks back on his time with King Raven or Rhi Bran y Hud. The Normans are changing the land, taking what was common land and forest for their own and many people are suffering, including King Raven whose lands were forfeit. Will has to prove himself in a test of archery and then is included on audacious raids. On one of these a manuscript, heavily embroidered gloves and a bejewelled ring are captured and it is these that lead to Will being captured, then rescued and travelling to meet Rufus the Red to tell him of a plot by his brother Duke Robert. The bones of the story of Will Scarlet and Robin Hood’s men and women are there as we know them, and so are the details of medieval life which make the story so credible. The legend of Robin Hood has been so embroidered through the years that this makes a refreshing change to read and it is highly enjoyable. The trilogy will be concluded with Tuck.